This is the second album in the Richard 3rd saga. 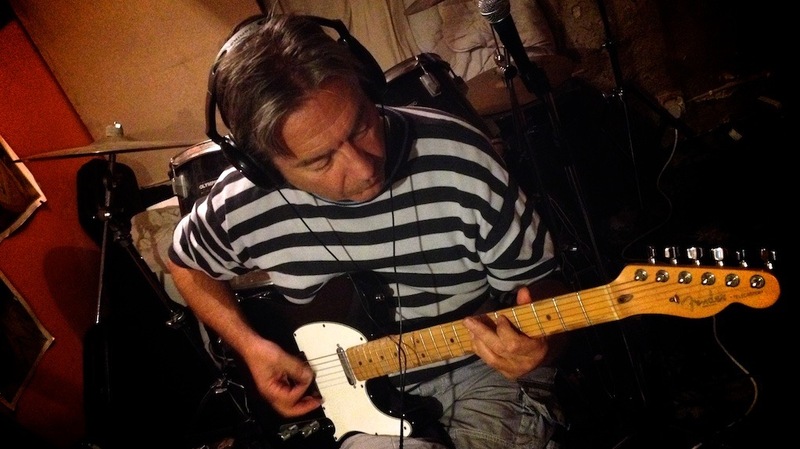 Joining us on "Tant Le Desiree" is Earl Robert of The Shroud, playing various guitars, banjo and lead guitar. His skilful playing has brought a fresh new feel to the music. A belated congratulation on getting this act to visit us. We have played their Tant Le Desiree CD ( provided by Toby ) and it’s brilliant. The electric guitar work on this CD is worthy of Eric Clapton! The first offering, Loyaulté Me Lie, is a collection of tracks about Richard III and his life and times. It first became available in January 2014 as a collection of mp3 downloads from Amazon and iTunes, followed by a physical CD later in the year. I downloaded it as soon as it became available and loved it instantly. It was well reviewed on Amazon by those who had bought it, and agreed to be a serendipitous mix of folk-rock and mediaeval nuances. The Legendary 10 Seconds immediately went to work on the next collection, Tant Le Desiree, which also started life as a collection of downloads, followed by a physical CD. There are 15 tracks on the CD, connected by a narrative written and read by the authoress, Sandra Heath Wilson. 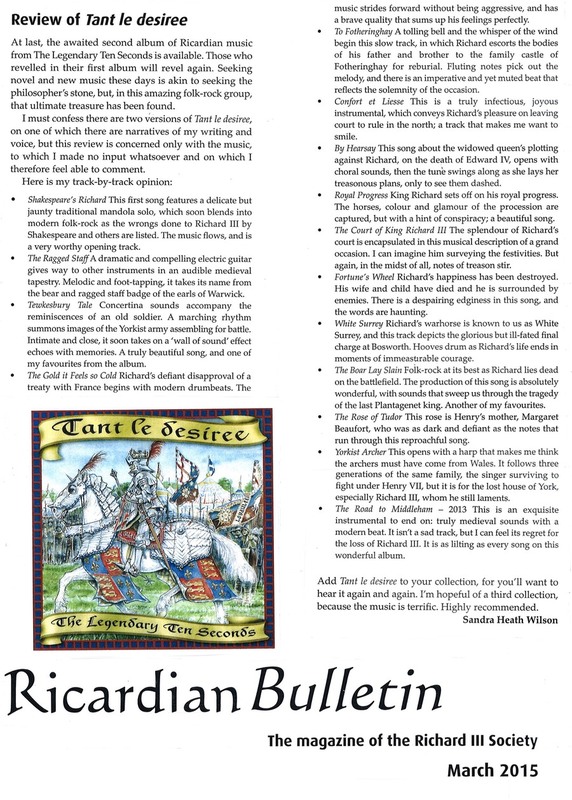 This narrative really enhances the CD by completing the story of Richard’s rise to power and his eventual downfall at Bosworth Field. The tracks on this CD are, in my opinion, far more polished and confident than those on the original Loyaulté Me Lie, and have some beautiful harmonies, both vocal and instrumental. A variety of musical instruments, both electronic and traditional, provide backing and the folk-rock style mostly played by the band contains mediaeval tones which complete the magic. All the wrongs done to King Richard III, by Shakespeare and others, follow on from the delicate but jaunty traditional mandola solo that begins the album. The mandola soon blends into modern folk-rock as the song reproves them all for perpetuating lies about Richard. The song flows, and is a very worthy opening track. Dramatic and compelling electric guitar notes command attention before giving way to other instruments that create an audible mediaeval tapestry. Melodic and foot-tapping, it takes its name from the bear and ragged staff badge of the Earls of Warwick. The reminiscences of an old soldier are at the heart of this track. 'Concertina' ripples change into a marching gait that summons images of the Yorkist army assembling for battle. At first intimate, it then sweeps away into a ‘wall of sound’ effect that seems to echo with the past. A truly beautiful song, and one of my favourites from the album. Mind you, it’s very difficult to choose a favourite—they’re all excellent. Richard did not approve of his brother's treaty with France, and modern drum beats accompany his defiant song. The music strides forward without being aggressive, and has a brave quality that perfectly sums up Richard’s feelings. A tolling bell, the sigh of the wind and a slow, lilting song marks the journey to reburial at Fotheringhay of Richard's father and brother. He accompanied the cortège, and fluting notes pick out the melody. There is an imperative and yet muted beat that tells us how seriously Richard takes his responsibility. A truly infectious instrumental that conveys Richard’s pleasure on leaving court to live and rule in the north of England. It is a track that makes me want to smile. A ‘choral’ opening leads into this song about Edward IV's widowed queen's plotting against Richard, who had been named as Lord Protector during her son's minority. The tune swings along as she lays her treasonous plans, only to see them dashed. King Richard sets off on his royal progress. The colour and glamour of the great cavalcade are captured, with the motion of the horses carrying the pageantry forward. And amid it all is the hint that betrayal is close to him. The splendour of Richard’s court is depicted in music as he presides over the festivities. But again, in the midst of joy, there are stirrings of treason. In this song Richard’s happiness has been torn apart. He is king, a young man, but his wife and child have died and he is surrounded by enemies. His life is as hollow as the crown he wears, and there is an edginess in this track that reveals his despair. Tuneful music and haunting words that warn of what is to come. Richard’s great warhorse is believed to have been named White Surrey, and he carried the king in that glorious but ill-fated final charge at Bosworth. The beauty and strength of the horse and the sound of hooves meld with Richard's immeasurable courage in the final moments of his life. Folk-rock at its haunting best as Richard lies dead on the battlefield. The production of this song is absolutely wonderful, with sounds that echo with the tragedy of the last Plantagenet King of England. A truly favourite track. The rose in this instance is Henry Tudor’s mother, Margaret Beaufort, who was as dark and defiant as the notes that run through this song, and was deserving of the reproach and condemnation that are also present. The harp at the beginning of this song makes me think the archers must have come from Wales. It is sung through the eyes of three generations of the same family, the singer being the one who survived to fight under Henry VII, but it is for the lost House of York, especially Richard III, that he still laments. An exquisite instrumental to end the album, true mediaeval sounds with a modern beat. It isn’t a sad track, but I can feel its regret for the loss of Richard III. A very appropriate piece to end on, and as lilting as every song on this wonderful album. The above is how I have heard and reacted to the tracks of Tant le desiree. Add it to your list, for it is surely something you’ll want to listen to again and again. A very worthy successor to Loyaulte me lie. I am hopeful of a third collection, because the music is terrific. Highly recommended. This is the second Richard III concept album by the Legendary Ten Seconds following Loyaulte Me Lie. As with that album this is very well presented, both musically and artistically, with rich vocals, fine instrumentals and excellent production. An absolute must for all Richard III enthusiasts, and anyone else who loves music. While the music naturally tends towards a medieval sound and feel, there is plenty for the folk/rock enthusiast to enjoy as well. A rich tapestry of sounds are created from a wide range of instruments, while some personnel changes on this album have added an extra dimension. Once again this album opens with a strong first track in Shakespeare's Richard, which sets the scene for the story to come. It is followed by a mix of rousing martial songs, soulful ballards and tuneful instrumentals. It would be hard not to find something to like here, especially if the guitar is your instrument. Tracks are accompanied by a short narrative which gives an insight into the song and charts the evolving story of the album. These add a nice touch and are very useful for those who aren't familiar with the history. To have had one folk-rock album (Loyaulte me lie) about Richard III was amazing; to have two is stupendous. Tant le desiree once again takes us to Richard’s world through music that is beautifully evocative, bringing together the sounds, sentiments and sensations of the 15th century with the rhythm, instruments and production of the present day. It is a heady brew, and as a devoted supporter of Richard III, who is also a devotee of folk-rock, I’m in heaven with this. There’s isn’t a single duff track, they’re all top quality, intimate and honest, some instrumental, some musical, some a novel blend of both, seeming to be instrumental but then blending vocals in too. I find the work of the Legendary Ten Seconds uplifting and rewarding, and if a third album should happen along, I will not hesitate to buy it. I urge you to try it too. You won’t be disappointed. A stunning follow-up to Loyaulte me Lie. Fourteen more tracks about the life and times of Richard III. More polished and confident that his first Richard III album, Ian Churchward's latest offering has a clear folk-rock background combined with mediaeval tones, giving an evocative feel to the music.Great lyrics by Ian and Elaine Churchward, excepting those of The Boar Lay Slain which has clever lyrics by Frances Quinn. Bouncy, memorable music on a variety of stringed instruments augmented by modern technology. Ian has a great voice and is accompanied on some tracks by Camilla Joyce or the Gentian Sisters, DD & Jingle. If you like Richard III, folk-rock music or just music that stays in your head all day, this is for you. Brilliant follow up to Loyaulte Me Lie, a must for any Ricardian or indeed anyone who likes folksy Rock music. I can honesty say that there is not one bad track on this album, it's very difficult to choose a favourite track, but I really like " White Surrey" A very powerful and emotive song about Richard's legendary destroyer, White Surrey "The Gold it feels so Cold" gives I think, an insight into how Richard thought "To Fotheringhay" a haunting song about the reburial of Richard's father and brother "The Court of King Richard III" let's the listener imagine what it must have been like at court in Richard's day....a highly entertaining album, and definitely recommended. Su Lamb.